For the full columns on each of these Washington Examiner pieces, click on the link embedded in the headlines. Not content to demand Play-Doh and puppy videos to soothe nerves after hearing unwelcome opinions, apparently 3 in 5 American millennials believe they live the most stressful existence in the history of mankind. And it’s not even April Fools’ Day yet. According to a survey of 2,000 millennials by the market research firm OnePoll, 58 percent of millennials say life is more stressful than ever before. ….. The fine publication First Things can do better. It has produced a manifestoof sorts for a new conservatism, supposedly making a major break from “the pre-Trump conservative consensus that collapsed in 2016” without necessarily embracing Trumpism per se. Entitled “Against the Dead Consensus” and signed by 14 usually insightful thinkers on the Right, it makes a big to-do about fighting “those who would resurrect warmed-over Reaganism and foreclose honest debate.”…. Trump undercuts the national interest by mollycoddling Kim (March 22): My colleague Tom Rogan superbly handles the disaster, in direct practical terms, that is Donald Trump’s decision today to reverse new sanctions that were about to be implemented against North Korea’s murderously unhinged regime. What remains to be said, yet again, is that this president’s adolescent admiration for “strong men,” including authoritarians and totalitarians, along with his purely-personally transactional approach to foreign affairs, creates a truly dangerous disregard for, indeed denigration of, the importance of human rights. ….. The best takeaway from Davis’ interview, probably, is to focus less on her criticisms of Trump than on the attributes of her father that she treasured and wishes still were treasured in public life. On those grounds, she is surely correct that we should aspire to Reaganesque personal decency and goodwill……. 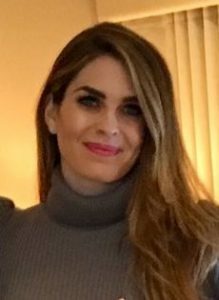 In the House probe, Trump must hope against Hope Hicks (March 21).